Astronomy is a big field of study — it’s the whole Universe, after all — and there’s a vast amount to know about it. Too much, it can occasionally feel like. It can be hard to know what’s important and what isn’t, what takeaway knowledge you should try to retain after hearing about some thing or another in the cosmos. Sometimes, I’m asked what I think is the single most important thing to know about it all. What’s the one thing people should understand about astronomy? I don’t even hesitate when I answer. The Universe is so big it crushes to dust our ability to truly internalize it. Think on this: The Moon is about 380,000 kilometers away. What does that mean in human terms? How about this: It would take nearly 6 months to drive there at highway speeds! And that’s the closest object to us in the Universe. In fact, things get so far away and so big so fast that even comparisons tend to get difficult. You may have seen a viral video or two showing the sizes of stars compared to the Sun. They’re nifty and all, but it’s easy to lose the sense of scale rapidly; we just aren’t equipped to grasp such scales easily. Our brains didn’t evolve for that. Happily, let Wren Weichman enter the fray. He’s a visual effects creator; he made a fantastic video earlier in 2018 showing just how big the SpaceX Falcon 9 rocket is. Like me, he’s been frustrated by attempts to show how big stars are, so he set out to do it better. I love how he kept the scale fixed, and made the Earth something you can literally hold in your hand. That keeps things grounded (so to speak) and graspable (so to speak). That just confirms that we’re miserable at this sort of thing. 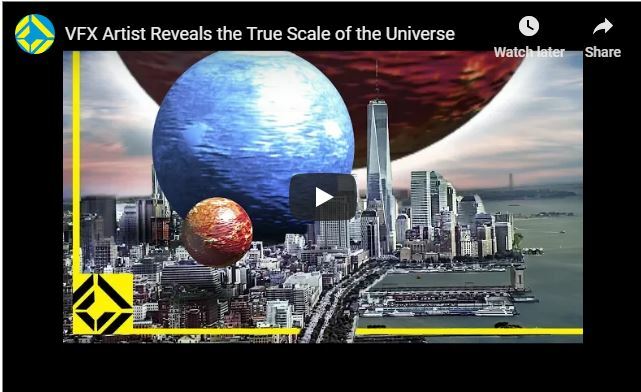 In his own video, Weichman also gives a shout-out to something I wrote a while back, checking the math on a claim that all the planets end-to-end could fit between the Earth and the Moon. Spoiler: It’s true. Amazing. There were a few other points he made that I want to comment on. One was about the star Arcturus. This is one of the brightest stars in the sky, easily found in the northern hemisphere sky in spring and summer. It’s an orange giant, a star that was once much like the Sun, but far older, and has used up its nuclear hydrogen fuel. It’s swollen up hugely, making it much larger than the Sun. Interestingly, according to current thinking, the Sun will actually be a far larger red giant than Arcturus is now… in six or so billion years. Weichman notes that Arcturus may have been born in another galaxy, a small one that subsequently was eaten by the Milky Way and is now a part of our galaxy. I hadn’t heard this idea before! I knew it was a “high proper motion star,” meaning it’s moving relatively rapidly across the sky. It’s part of a stream of such stars, a collection of them moving together through space. This isn’t uncommon, but these stars are all moving rapidly, and more curiously they are moving up and away from the plane of our galaxy’s disk, whereas stars like the Sun stay more or less inside the disk. Their weird direction is easily explained if a smaller galaxy fell into ours at an angle and was ripped apart by the Milky Way’s gravity. That’s pretty cool. Also, he notes that UY Scuti is the largest star known. Wikipedia lists it that way. If you read the notes on that list, though, you’ll find all sorts of caveats about size, and that really is the case. It’s very difficult to measure a star’s size because it can change, and the distance may not be known well. Worse, in the case of red supergiant stars, they don’t have a real surface. Stars are made of gas, and like our atmosphere they get less dense with distance from the center. However, in the case of small(ish) stars like the Sun, the edge is relatively sharp compared to its size. With red supergiants it’s not at all that easy. They just get less and less dense, fading away with distance. Worse, they appear to have different sizes depending on what wavelength of light you look! So I’d say that UY Scuti may very well be the biggest star known, but it’s not certain. It’s definitely ridiculously huge, though. In that vein, Weichman also says the red supergiant Betelgeuse will explode in less than a million years. That’s correct! No one knows exactly when, but it’ll be a long time from now… on human scales. In cosmic terms that’s pretty soon. Which brings us full circle back to scale. It’s hard for anyone, even seasoned veteran astronomer/science communicators, to truly grasp how big stars are. Weichman’s video does a fantastic job of this. Seeing those supergiant stars towering, looming over a city… that does (literally) bring it home. The next time you go outside and look up, take in the stars you can see. Note how small they look, dwarfed and dimmed by their terrible distance. Pretty much every single one of those that you see is bigger and brighter than the Sun, yet the Sun itself is a monstrous object of terrifying size. Weichman ends the video saying this knowledge makes him feel physically small. Honestly, me too. But the thing is: We do know all this. We used science to figure it out. To me, that makes us huge. Tip o’ the lens cap to Wren Weichman for sending me a note about his video. FWIW I urged him to take it the next step and try to show the scale of the galaxy. That’s a lot harder, but he’s very talented. I hope he tries it!